Technology is transforming the world as we know it. It seems that every day a new platform to simplify and old process is made available, and another solution to streamline the way we work is put in place. As we continually adjust to the digitization of work, we must also contend with another first: five generations co-existing in the workforce. It’s generally accepted that of the five generations, millennials and Generation Z are the technically savvy populations while Traditionalists, baby boomers, and (to some extent) Generation X are not as comfortable with all things digital. In fact, it’s often perceived that the older generations are hesitant to adapt to the changing tech trends for fear of losing their jobs or being seen as “obsolete,”. This may seem like a valid fear, but it doesn’t have to come to fruition. What happens if the leader acknowledges these fears, but take steps to ensure that no employee gets left behind during a digital transformation? A broad understanding of each generation is helpful, but remember we aren’t here to point out why baby boomers and millennials are vastly different because recent research has shown the opposite to be true. Interesting research has been done on the role of technology in personal and professional lives, but some of the greatest pieces of data reveal that technology reaches across the generations and is not just for millennials. A recent study from Pew Research Center reveals that more than half of all baby boomers have a smart phone, own a tablet, and use social media (67%, 52%, and 57%, respectively) in comparison to Traditionalists where 30% have a smart phone, 25% own a tablet, and 23% are active on social media. As companies become more global, communication will evolve, and it’s likely that email will become a thing of the past. In its place will be applications such as Slack, which older workers may be hesitant to use. This shift in communication creates the perfect opportunity for reverse mentoring, where younger employees are paired with older workers to teach them about social media, artificial intelligence, and other new tech. 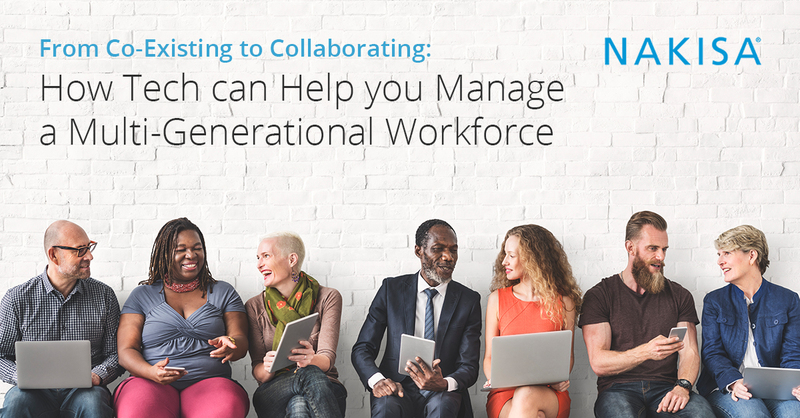 This kind of collaboration is beneficial in multiple ways, such as encouraging cross generational knowledge sharing, helping to prepare younger workers for future leadership roles while also boosting confidence (and new skills) in older workers. Hand-in-hand with digital globalization is telework. Technology allows us to work anywhere, at any time, and from nearly any device, and this flexibility is something younger generations appreciate. Older generations, however, may not be as easily swayed and can prefer on-site, 9-to-5 jobs. Ensuring that they fully understand the best ways to communicate and work with their off-site colleagues and that they know flex time is an option if it’s ever needed can encourage them to view their working environment in a different context. When employers analyze what perks and benefits attract and retain younger workers, it’s also important to look at what can be done for older employees. Take, for example, Ai Squared, a company that has created software for people with macular degeneration, an eye disease that primarily affects older adults and makes it difficult to see black text on a white screen. With this software, users can change the color of the background and text on-screen to help them read email and type documents in Word. Microsoft has an accessibility website which provides downloadable guides for improving tech usage and experiences among people with varying degrees of disabilities from vision to hearing and physical mobility—much of which impacts older workers. For example, adding captions and pop-up notifications rather than relying on sound will help people with hearing limitations remain engaged in work and able to participate in video conferencing. Digital transformation isn’t just for young folks and shouldn’t be seen as beyond the Traditionalists in the workplace. The older element of your workfoce bring invaluable knowledge of your business and have skills younger workers may never develop. As technology continues to transform our lives, Take advantage of the ever-increasing tech developments to make the 5-generation workforce the model of the future. If you don’t you may lose out on key talent that isn’t as easily replaced as your iPhone. What technology have you implemented to help bridge the generation gap? Understanding Nakisa Hanelly: Important Views and How To Use Them.